The festivities started off Friday afternoon around 1pm. As I was getting out of the shower, I heard the patter of what sounded like dozens of feet going up the stairwell along with many various teenage voices. I knew that there aren’t many kids that live in my building, and I somewhat assumed they were heading up to my apartment, but I honestly hadn’t the faintest idea as to why. I hurried up and tried to make myself look presentable and then came the knock on the door. 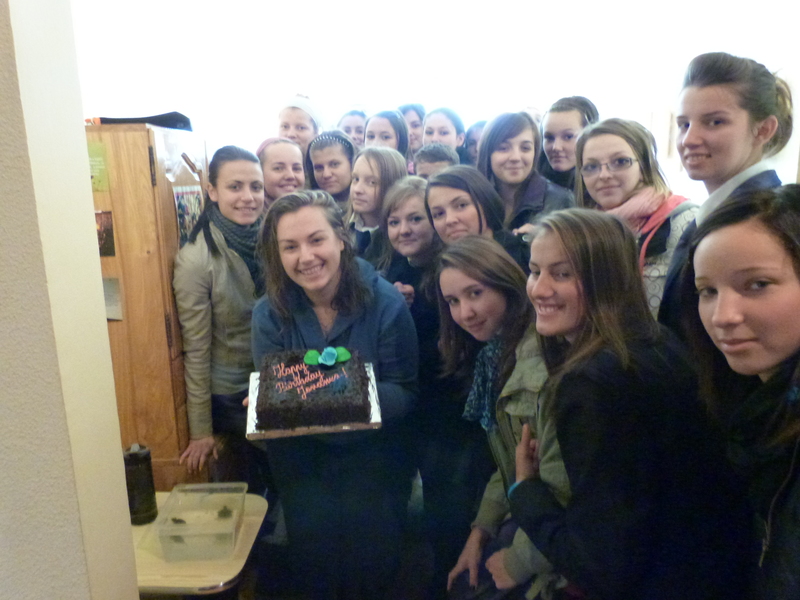 When I opened the door, to my surprise, stood the entire class of 10B -all 32 of them- with a cake and flowers in hand bellowing out happy birthday dear teacher in their best English accents they could muster. I stood there for a few minutes in shock because I had no idea how the hell we were all going to fit into my apartment. nonetheless, I invited them in and after about a 2 minute parade, everyone finally managed to squeeze themselves into my living room for a photo op. I now know what it feels like to be in a clown car. After seeing them out, I finished up my packing and headed to Cluj (a nearby large college town) for the weekend for the country wide Peace Corps EAP training. EAP stands for Emergency Action Plan. Basically, every PC post is required to have one just in case something happens within the country and all of the PCVs need to be evacuated. How the EAP works is, if we receive news that we have to leave the country for some safety reason, we are to go to our designated consolodation point and wait for further instructions. The points are chosen based on size of city and how close they are to an international airport. For the volunteers that live in northern and northwest Romania, Cluj is our meeting point. We were required to arrive by noon on Saturday but since that would mean I would have to get up at 4am on Saturday morning to make it, I just decided to get in Friday night. I got into my hostel around 9pm where I put down my stuff and met the rest of the fellow travelers that were staying at the hostel. Another PCV, Kevin, made it into the hostel around 10 where we hung out for a little bit before we hit the town with the rest of the group. 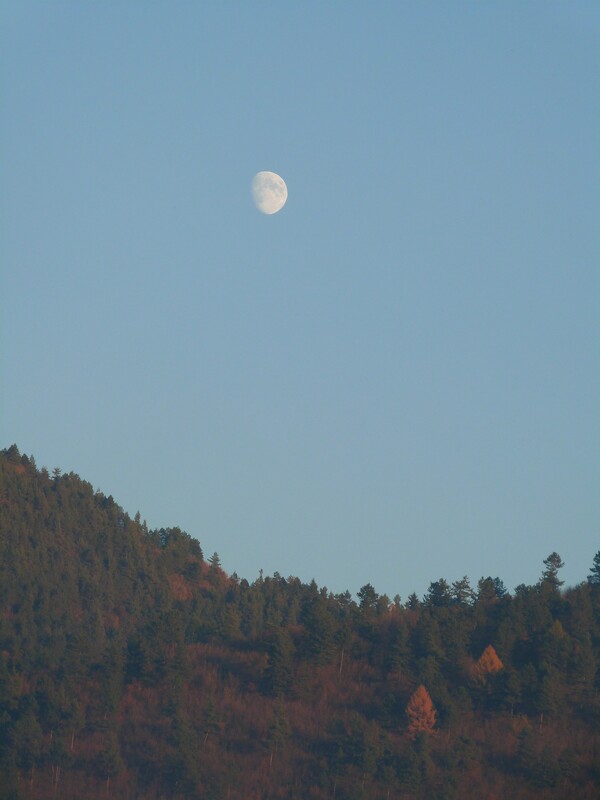 Saturday morning, we woke up around 10 and headed to our consolidation point. Since the hotel where we are supposed to meet had no idea that we were coming, we decided to just have our actual EAP meeting in the lobby of our hostel since most of the volunteers knew where it was anyways. after about 2 hours, our meeting, along with the EAP test was over and we were free to do whatever we wanted. 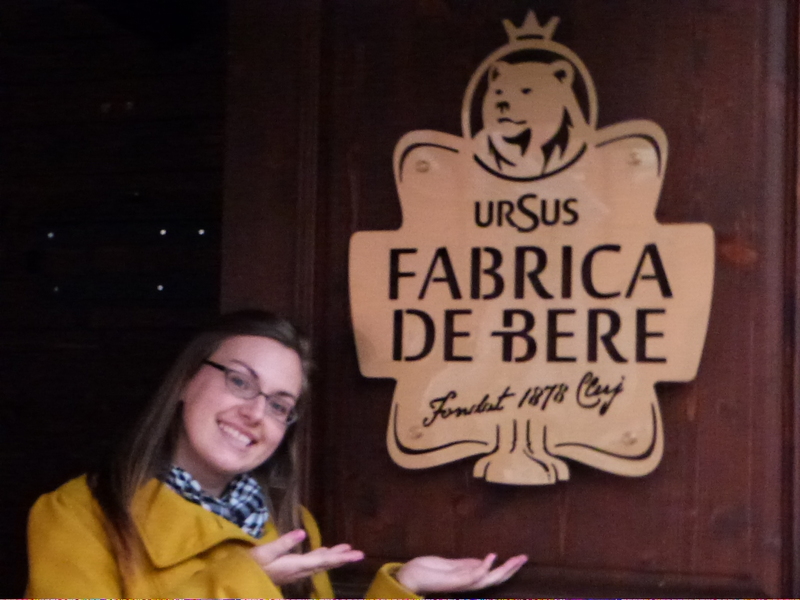 We decided to grab some lunch at a very tasty restaurant that a 3rd year PCV suggested. After our meal, Chip and Ester surprised me with homemade apple cake with buttercream frosting, American flag posters, stickers, a small mouthwash bottled filled with Maramures Tuica along with many other goodies. 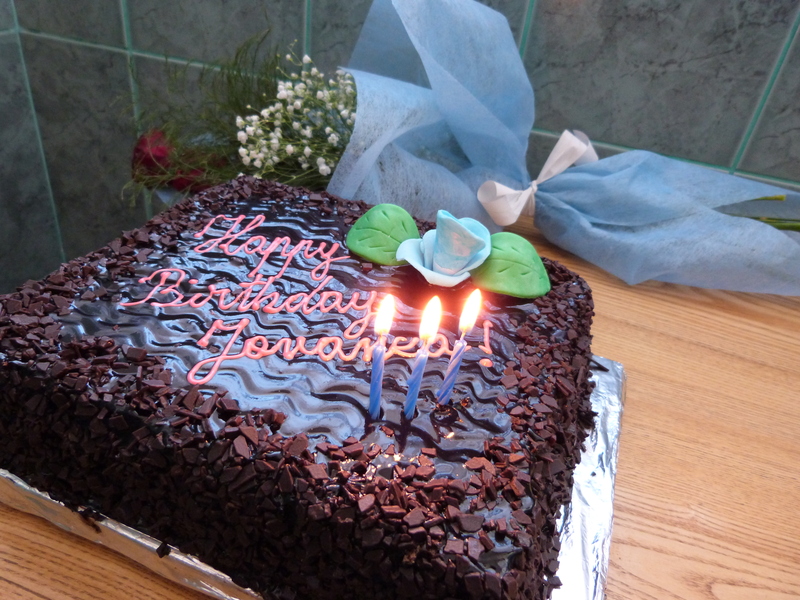 We dealt out the cake and the glasses for the tuica with which we cheered to my birthday and sang La Multi Ani. 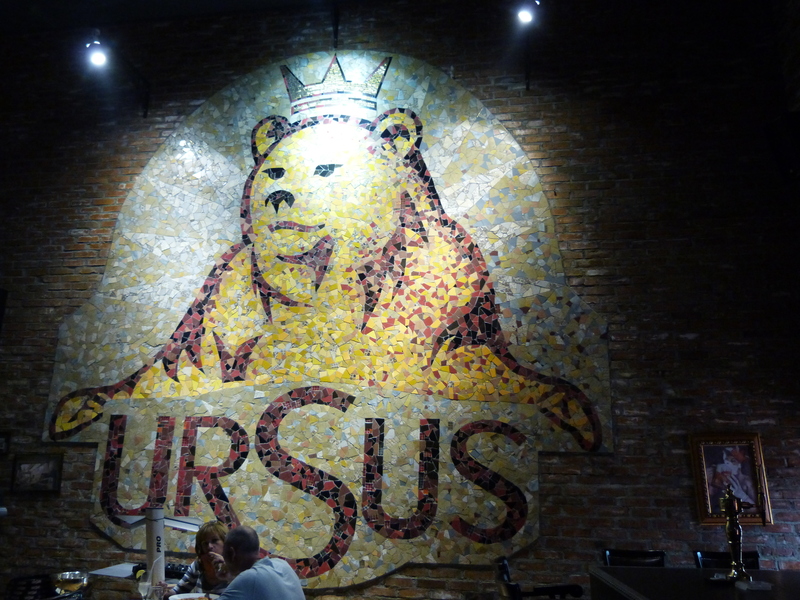 Following lunch, we went in search of the Ursus Beer Factory that we had heard was in Cluj. After about a half hour of walking with a map that ended 1/2 a km short of where we needed to be, we saw the 6 enormous beer silos of the factory peeking out over the buildings. We went inside and were told that we would not be able to go on a tour but we could patron the restaurant. We hung out at the restaurant for a little while and then the girls headed out to the mall to do some much needed grocery shopping for Megan, and turtle home shopping for me. I got back to the hostel around 9pm where I met the boys up for dinner and by 11pm, after thanking everyone for the birthday wishes via facebook and talking to one of my students, Traian, that built me my own personalized blog for my birthday (details soon to come), I headed to bed to rest up for the trip back today. I got back into site around noon where I immediately started making some apple pie that I plan to bring to school with me tomorrow as a treat to all the teachers for my birthday. I am very self aware. I know what I am, I know what I am not, and I know I am NOT a baker, yet there is a part of me that wishes I could be and constantly tries to bake concoctions. I finally finished the pie after making such a mess in my kitchen that it took me twice as long to clean it up than it did to make the pie, I am ready for the school day tomorrow. I’m looking forward to this week since I get to travel again next weekend to Suceava for a PC sponsored language refresher weekend that Melissa has planned. Until next time, Va pup!